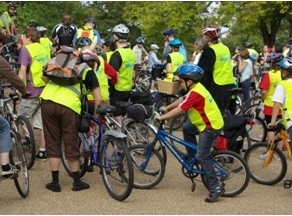 This years Skyride in early September saw thousands cycle into a car-free central London from Lambeth. Here Lambeth Cyclists’ Clare Neely reflects on leading one of the feeder rides to the event, successful inspite of her concerns about the corporate sponsorship by Sky. She writes “Hi I am Clare, your Skyride leader! It all came out in a rush -'My son is autistic and he has never ridden on the road before' 'oh' I said more breezily than I was feeling, another added 'my niece has autism and I regularly cycle on the road with her' She visibly relaxed and by the end of the day everyone in the Lambeth Cyclists ride from Streatham Hill had ridden back routes, off road and done right turns onto Major Rioads in South London Sunday lunchtime traffic. The key I discovered was drawing on years of amateur dramatics to exude confidence, a fantastic set of marshalls who interpreted freely Murdochs’ Skyride instructions and letting the bossy year 7s come up to the front and show everyone their looking behind and signalling.